Ganapati is the 'Brain' of us. This was my explanation for the stotra starting 'Suklam Bhartram Vishnum'. In this blog I would explain the same with respect to the popular Rg Veda mantra that is recited before every vedic ritual as prayer to Vinayaga. The friend and guide of your attendants, Call on you to grant the wisdom of the wise ones, highest of pinnacles of hearing. The first ruler that evolved, the one that leads/guides our further evolution, having heard, the seat that weaves thoughts. We call upon the brain to grant us the Wisdom of the Wise ones, highest of the pinnacles of hearing. The pinnacle of hearing is learning. Highest of the pinnacles of hearing is the highest of learning. So here we call upon our brain to bestow us with highest of learning. Brain is the ruler that evolved to rule over all the attendant organs of our body. It is the 'first' ruler or the predecessor to all the rulers of the world. It is not just the one that evolved, but also the one that guides/leads further our evolution. So it is uniquely placed. It is the one that evolves others and also the one that is evolved. Having heard (having learnt), it is the seat of thoughts, where our thoughts are weaved. In general Upama Shravastamam is interpreted as pinnacle of 'fame'. Zrava is extended from hearing to praise and then extended from that praise to make it as 'fame'. Similarly Jyesta Rajam' is interpreted as foremost amongst the foremost. Rajam is interpreted as 'foremost' (in the sense rulers are foremost). "Brahmanam Brahmanaspata" is interpreted as Lord of the Vedas. Vedas are those that evolved (Brahamanaspata) and Brahmanam is interpreted as Lord BrAhman. BrAhman actually means evolution. Atman when it decided to evolve became BrAhman (evolution). Thus that Supreme Soul manifests as evolution. "Utibhih Sida Sadanam" is interpreted as "Protect us by seating here". Uti means weaving, sewing and also protecting (weaving gives protection). 'Cida' is thoughts. Often it is ignored or taken as 'sIda' and interpreted as gracious, happily. Thus the conventional meaning becomes "We invite you, the lord of all groups, wise amongst the wise, lord of all Vedas, foremost amongst foremost, whose fame is excellent, be seated and protect us", one that is applied to an external Ganapati. The real meaning in my view is "The friend and guide of your attendants, Call on you to grant the wisdom of the wise ones, highest of pinnacles of hearing, the first ruler that evolved, the one that leads/guides our further evolution, having heard, the seat that weaves thoughts", one that is applied to the internal Ganapati our brain. The supreme consciousness manifests in our heart and controls our brain, which evolves us and also evolves. That does not mean we need not worship/invoke an external Ganapati. We can and we should. We should invoke that Supreme Consciousness that is present in the 'Lord Ganapati' to guide our brain and lead/guide us in all our actions. Excellent post! especially for this generation. 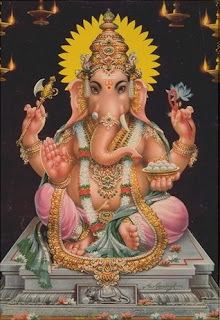 Dear Guruprasad, Ganesha = esha of all the ganas = God. There is no mention of a god having elephant face, and big stomach in vedas nor in upanishads...Only puranic pundits have installed such GOD. Lord ganapathy is an amazing allegory he has a golden spiral inherent in his trunk (energy which sustains everything)symbolically in his trunk ,few temples in south India /symbol of ucchista ganapathy one could see it ,fact is that all Hindu gods were consecrated by Vedic maharishis,siddhars,greatest yogis,sthapathya maharishis(like Mayan who was a danav)...etc as per the nature of unified field (field of Brahman)and paramanu(Brahman as subtle most particle)......historically speaking lord Ganesha is more than 35,000yrs approximately.